READYVILLE - A small furniture manufacturing company is rocking the world. In keeping with a multiple-century Cannon County wood-working tradition, craftsman/artist/designer Alan Daigre and associates are creating chairs and rockers that are being sought in Europe and throughout the U.S.
Alan Daigre Designs began 15 years ago in a remote wooded area off Ferrell Hollow Road. "We've shipped 'rope chairs' to Europe," Daigre shared. "Although we've only branched out from rocking chairs the past 10 years, we've already sold product in 35 U.S. states, with a goal of marketing in all states." "Our signature is a line of 'rope and block rockers' that comforts everyone who tries them," Daigre noted. "Our designs are not forced ... inspired by natural wood textures, and clean, simple lines. Our chairs are all wood components that flex and mold to the individual seated, with the one-piece rope that helps tie it all uniquely together for more comfort." 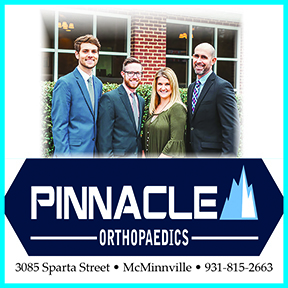 "Our chairs are frequently complimented by people with back problems," diagnosed Daigre. "For years I made nothing but rocking chairs, but kept getting the question: 'When are going to going to do this as a dining chair?' I guess I finally heard it enough. I teamed with the renowned furniture maker/designer Matthew Teague to design side chairs, bar stools and arm chairs, and the response has been tremendous." He stopped to point out one his latest creations. "Using the unique rope and block elements of the rocker, we have created a handsome dining chair that will be enjoyed by families and guests for years to come, for generations to come," the design man shared. "Materials are selected based on grain patterns and texture, and careful attention is given in detail in joinery and finishing work." The woodworking artist incorporates traditional 'Post and Rung' and 'Mortise and Tenon' joinery using hand-carved pegs, resulting in a finished piece with strength and integrity. Daigre estimated it takes several months to create a finished product. This unique business is good for the local economy too. In early mornings, neighbors can hear the "buz" and "whir" of saw blades and sanders as Daigre, shop manager Dallas Stout and young craftsman Dillon Matheny shape, mold and create some of the most unique seats to be found in the U.S.
"We also help support local businesses when possible," Daigre accounts from his studio-workshop in the woods, not visible from the closest paved road. "Sometimes we'll buy logs of Tennessee hardwood, and patiently cure and season them here on site. 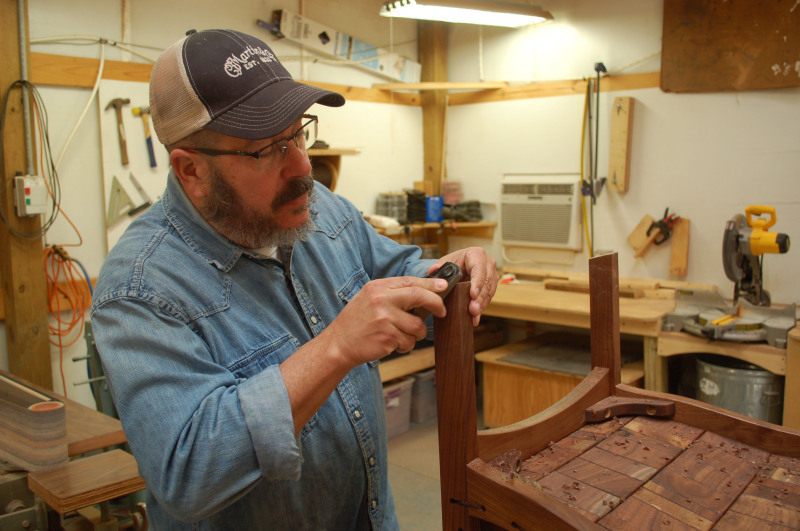 "We use a lot of walnut, cherry, maple, mahogany ... plus other Tennessee hardwoods when possible," Daigre notched. "Our most recent additions to our furniture line are office chairs, as we expand into the future." And they do specialized "customized jobs." "We created a dining room set for former U.S. Vice President Al Gore," Daigre shared. And he wonders if newspaper readers can keep a secret? "The Tennessee governor's wife has ordered a special rocking chair for her husband, so ask your readers to not spoil the governor's Christmas surprise," Daigre encouraged. The small company has some powerful big machines, but there's a wide array of personal hand tools hanging on the walls. "You need the right tools, for the right hands, in the right place and time to work the seasoned hardwoods," Daigre diagnosed. 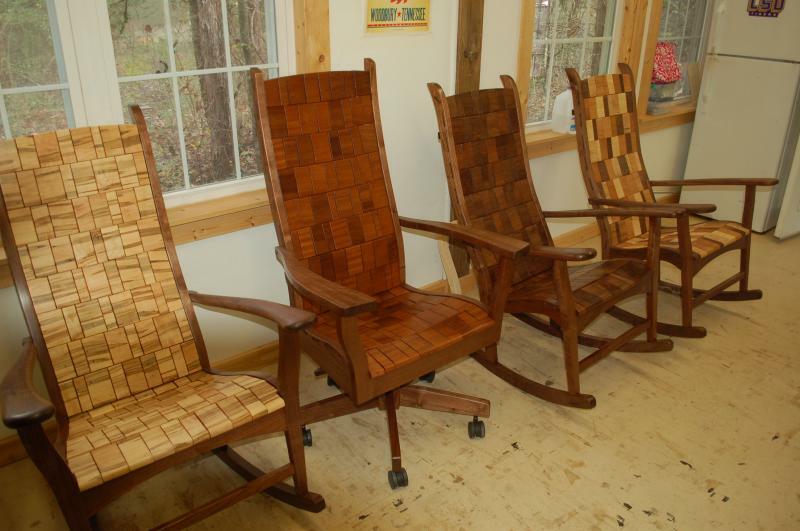 "There's a lot of satisfaction in feeling and watching the wood transform into a beautiful rocking chair." Creating chairs have proved therapeutic for the 52-year-old Daigre, who diagnosed himself as a "burned out" former mental health counselor. "I did counseling for 20 years," Natchez, Mississippi Daigre added. "But I wanted to live a creative life. After meeting and marrying my wife, Cindy, at MTSU, when I left mental health counseling, I attended a wood-working class over in Dekalb County. That got me hooked. "Cindy had this home place here in the woods before we married, so if I wanted to be in her life, it was move here on these 70 acres where Cindy takes in abandoned and abused older big work horses," Daigre added. "I didn't want to commute 70 miles each day back and forth to Nashville, so I began thinking about something creative to make a living here on the home place." He had no previous wood-working experience. "I never considered wood working as a vocation, or as a hobby," Daigre shared. Although there's no daily "commute" from Nashville, Daigre stays on the move. "Although I'm only a 2-minute walk from the house to our studio/workshop, I put over 50,000 miles a year on our work vehicles, doing trade and art shows in places like Asheville, Baltimore, Washington, D.C., Atlanta and Florida," noted Daigre, who was in Chicago for a trade show when initially contacted for this interview. "You have to have complete confidence in your co-workers, when you're out on the road for marketing," Daigre added. "Shop Manager Dallas can create and make anything in our product line, a truly gifted man. "Young Dillon, age 18 now, began with us as an apprentice at age 11 back when he was being home schooled," Daigre described. "He began by sweeping shavings and sawdust off the floors. He's still with us." The home place is like stepping back in time and has a sense of permanence like the wood that goes into the chairs. "That old chimney (near the modern studio/workshop) goes back well into the 1800s before the Civil War," Daigre stepped back in time. "In that era the original house was built entirely around that chimney. But, the main old house around the chimney burned in the late 1890s. The present-day old cabin served by the historic rock chimney, was my first workshop and studio."